Safe at home, fully retired with time to putter around the garden, former Internal Revenue Commissioner John Koskinen is no longer under threat from congressional Republicans who demanded his impeachment. In a wide-ranging interview with Government Executive on Nov. 21, the man President Obama brought in as a “Mr. Clean” to fix the beleaguered IRS expressed disappointment that the Senate appears poised to continue cutting the IRS, a habit of the Republican-controlled Congress he regularly warned against during his four years leading the tax agency. Koskinen, still referring to his former agency as “we,” pointed to only a small silver lining in the bill reported out by the Senate Finance Committee on Nov. 16 that proposes cuts of about $110 million from IRS’s current spending levels, roughly equal to the proposal from the House but with less than half the cuts requested from the Trump administration. “When people talk about cutting by another [$110 million], they often don’t pay attention to the fact that we also have to fund pay raises and inflationary costs, which are another $150 million to $200 million,” he said. “So it’s really a cut of $300 million.” That’s leaving aside any new costs for implementing a new tax code, should tax reform pass, he noted. Though popular among IRS employees who valued his accessibility during town hall meetings, Koskinen endured continuing outrage and lengthy investigations from House Republicans who believed he misled Congress and tolerated the destruction of evidence in the dispute over alleged political bias in the IRS’s Exempt Organizations division’s mishandling of nonprofits seeking tax-free status as social welfare organizations. It was important to Koskinen that “taxpayers understand not only that everyone gets treated fairly, but that we’re doing our best to respond to every taxpayer inquiry,” he said. His hope is that, after the initial report on the alleged political targeting from nearly five years ago, a more recent report on the division’s handling of applicants of all persuasions “will set the whole issue to rest. Then I hope Congress and the administration and the IRS will have a more reasonable discussion about the IRS budget, focused only on what IRS needs, rather than on ongoing attempts to punish the IRS,” he said. As he has repeatedly, Koskinen warned that political disputes threaten the “crucial services” the IRS provides in processing 150 million individual tax returns efficiently and collecting over $3.3 trillion—more than 90 percent of the government’s revenue. Does he have any regrets over his own handling of evidence demanded by Congress during the political targeting controversy? Many in Congress never read the thousands of pages of documents IRS provided, he added. In testimony in May 2016, Koskinen said the IRS incurred more than $20 million in expenses and devoted more than 160,000 man-hours to collect, review, and produce approximately 1.3 million pages of documents during the investigation. “My theory of management has always been that you need to make sure information flows from the bottom to the top as well as from the top to the bottom,” he said. That problem revealed itself in recent corporate scandals, such as the General Motors faulty ignition switch, Wells Fargo’s creation of unauthorized consumer bank accounts and Volkswagen’s fudging of emissions tests, he noted. 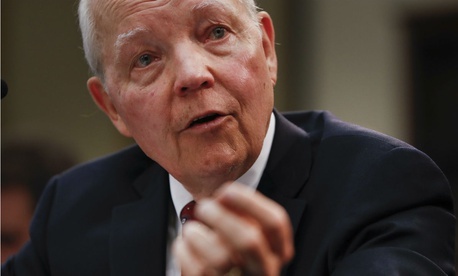 Koskinen said he never spoke to the retired Lois Lerner, who came to embody IRS politicization in the minds of her Republican critics, though the Justice Department twice ruled out criminal charges.